September deserves its own “before and after” photo. Before September, we are pretty relaxed, riding the summer vibe. By the end of September, we’re frazzled and frantic, crushed by the sudden amping-up of our schedule and our expectations. Those with kids in school are overwhelmed by the new school year’s adjustments. Every one of us also faces a big realization in September: the end of the year is a few weeks away. We take stock of our goals and resolutions and recommit ourselves to them. How many of you participated in the 30 Paintings in 30 Days project this September? I want to give a huge congratulations to anyone who successfully completed it—and a big hand to anyone who gave it a try! I’m with you—I too faced the September stress mess this past month. As I reflect on it now, I see how critical my self-care practices were to getting me through it in one piece. I’d like to share some of them with you, and I’d love to hear about some of your self-care tips and routines in the comments. Deleting Facebook from my phone was a productivity hack but it also had a positive impact on my mindset. I felt less distracted by constant notifications, which are so hard to ignore and even harder to not respond to in the moment—all pulling me away from my work and out of my flow. Interacting on Facebook became a mindful activity that I would accomplish when I sat down at my desk. Staying off my phone first thing in the morning and doing short meditation or journaling sessions instead. This is the best way to set my intentions for the day and get in touch with myself. The day starts with peace and not from a place of reactivity. 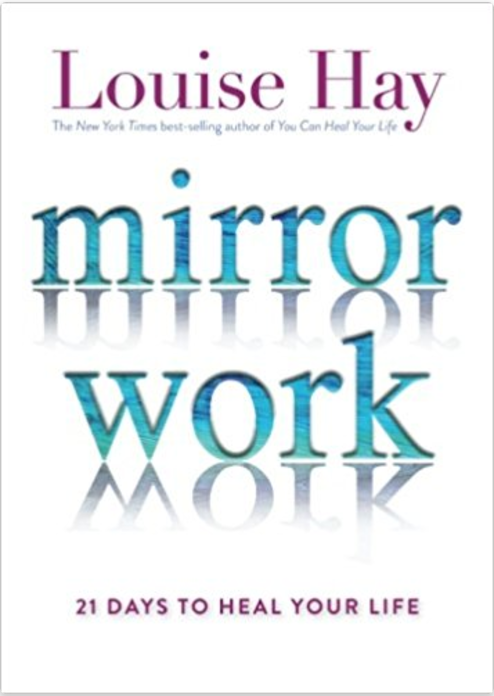 Some days I use Louise Hay’s wonderful book Mirror Work to guide me through self-love exercises or mirror work exercises. I have also found that starting my day by diffusing essential oils makes a powerful difference in my frame of mind. My favorite type of oils are Doterra oils. Do any of you use oils? If so, I’d love to know how you use them and what your favorites are. As September wore on, I struggled with whether or not I could—or should—attend an art workshop in Sedona that I’m registered for that takes place the first week in October. If you follow me on Facebook or IG or both haha, you are aware that I even offered up my spot. I had a lot of thoughts of resistance, such as thinking that I was way too busy and that I didn’t need to guilt myself over skipping it. But after practicing some of my grounding rituals, I was able to realize that I’m not as overwhelmed as I was letting myself feel. I can give myself the gift and investment of this five-day workshop. This is an act of self-love. The fact is, too, that I could always talk myself out of going to an art workshop: if things are busy, I could tell myself I can’t get away; if things are slower, I could convince myself that I need to stay home and hustle to pick things up. The bottom line is that I know that I deserve and need to be inspired and rejuvenated by these retreats. They are an investment in myself. Taking good care of myself and investing in myself have led to abundance and prosperity, so I need to keep up my end of the bargain. Speaking of art retreats—I attended a life-changing retreat with the remarkable Desha Peacock in San Miguel de Allende last winter. Her retreats for creative entrepreneurs sell out every year, and for good reason: phenomenal content and leadership in an inspiring setting (a beautiful mansion in a gorgeous artist town). Desha is an amazing and very present retreat leader, and I found this retreat very nourishing. It was a large investment, and I felt that it was worth it—and I am worth it. I am thrilled to be returning in Jan 28-Feb 3, 2018 to teach an art session as part of the retreat! There are only two more spaces left. Would you like to come? Take a look at the link, and let’s meet in San Miguel! I hope that the beginning of October finds you well. I hope you are taking good care of yourself and investing in yourself. You deserve it! I look forward to sharing my trip to Sedona with you, and to hearing about how you practiced self-care to get through September!